Liberals Increase Minimum Wage: Result is More Unemployment, Government welfare, and thus, Higher taxes for all of us. SURPRISED???? 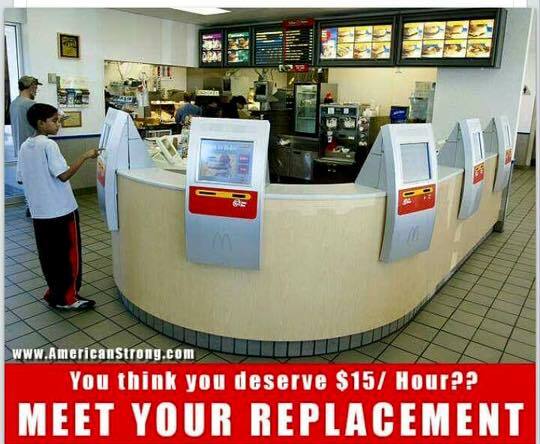 McDonald’s Announces Its Answer to $15 an Hour Minimum Wage – Touch-Screen Cashiers. Fast food chains were never meant to be a place for someone to raise a family of 6. They were to be part time positions with some full-time advancements. Directly from YOUR rhetoric and demands against America’s private businesses, you and your minions just single-handedly put 10’s of thousands of minimum wage workers nationwide on the unemployment line!